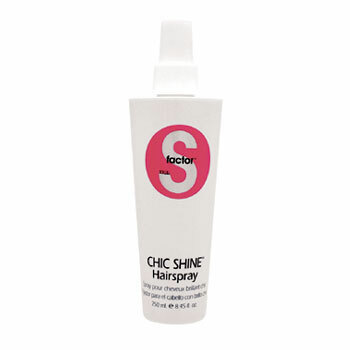 S-factor Chic Shine Spray will give you classic glamour without the effort. Chic Shine Hairspray gives unbelievable hold with an incredibly sleek finish. Its fantastic apple and kiwi scent keeps you feeling calm all day long! For body - hold sections of hair up amd pump a little Chic Shine into roots as you let it fall, creating luxurious shine with great hold. For a glamorous up-do, pin hair up and mist Chic Shine all over to create soft shine and hold.